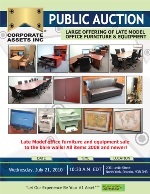 Corporate Assets Inc. | Large Offering of Late Model Office Furniture & Equipment - Corporate Assets Inc.
Late Model Office Furniture and Equipment Sale to the Bare Walls! All items 2008 and Newer! FEATURING: (6) DELL VOSTRO 200 desktop computers with flatscreen monitors and CORE 2 DUO processors; IWATSU OMEGA phone system with handsets; RHEEM water heater; GE fridge and microwave; (8) high quality workstations made my manufacturers such as HAYWORTH; over (30) ergonomic rolling chairs; XEROX & SAMSUNG multi purpose printing/scanning/faxing units, office prints and maps, light fixtures, window coverings, bathroom verandas with sinks, kitchen cabinets and sinks, and more!